This part is critical and brings us to the second main reference which is an hybrid of contemporary startup culture (with a sustainable twist) and DIY local manufacturing processes. 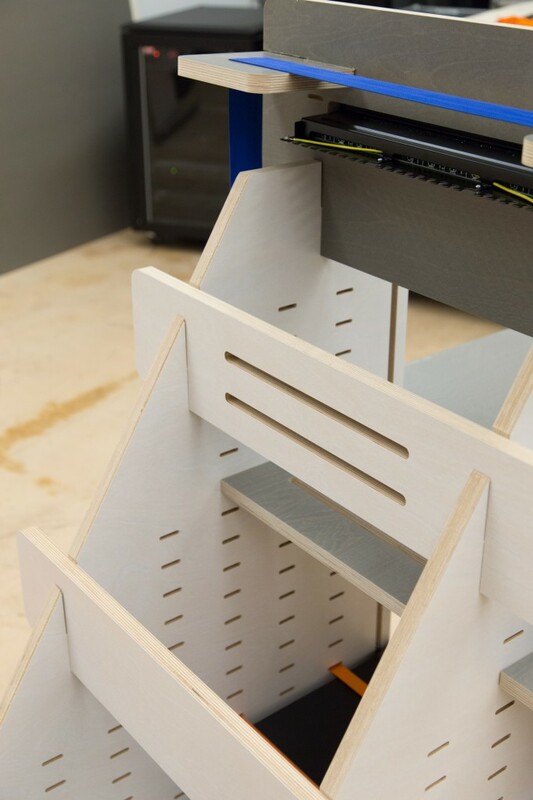 In this particular case, Opendesk appeared as an relevant example of this smart balance between design and accessibility (although you still need access to a industrial-scale CNC milling machine to “Do-It-Yourself”! 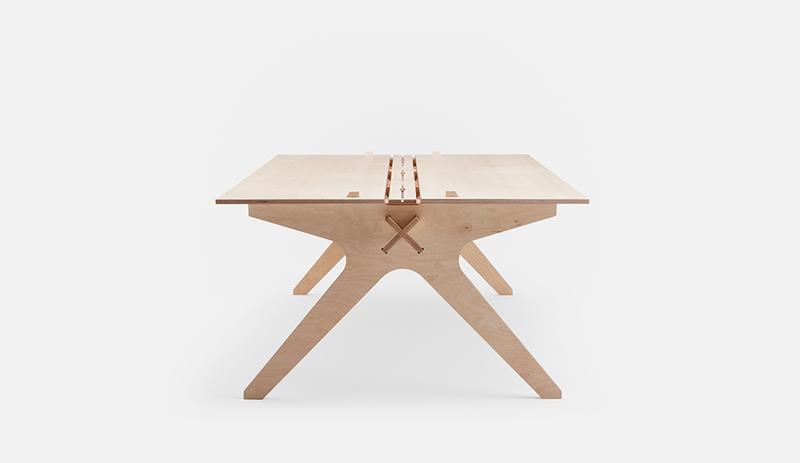 However it isn’t OpenDesk’s business model which got our attention as much as their aesthetics, with apparent hints of the fabrication process used and assumed in the object’s visual identity. On this base we prototyped our first domestic 19″ rack and kept along the way a few core features. We also kept in mind the different contexts and functional modularity (technical base, office, home) we desired to address. We also took into account some “climatic” parameters that needed to be moderated or exploited within a domestic context (production of hot and dried air by the computer servers, mainly). A 3d view and design iteration of the technical base for our server rack, as modeled following the constraints of CNC fabrication (image above). We chose to assemble elements following the simple “House of Cards” principle (below). 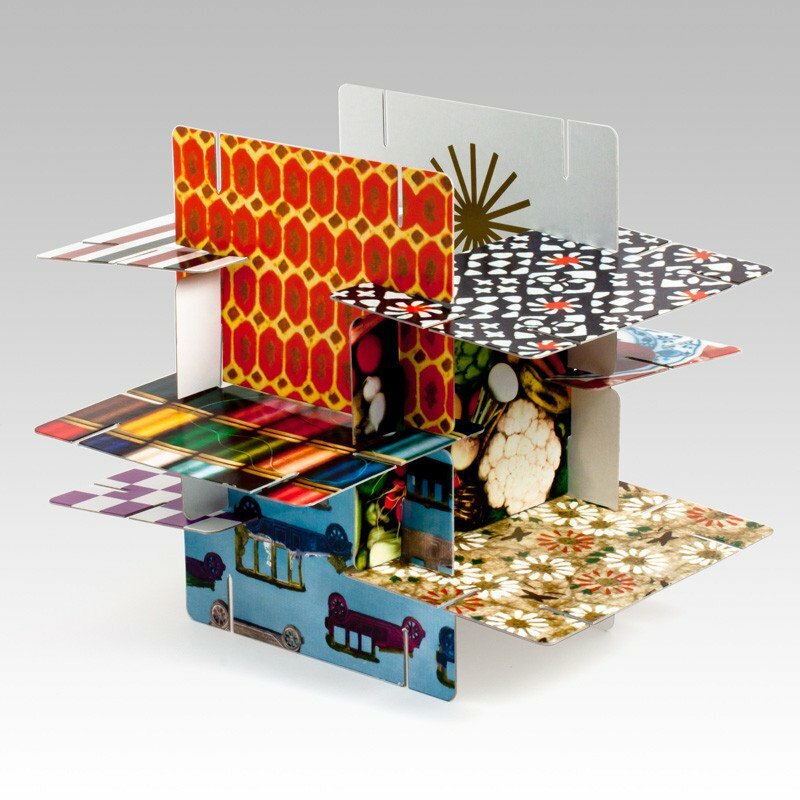 The assembly is solely based on a perpendicular “card” system, which is in turn held together by straps maintaining a regular tension between elements. 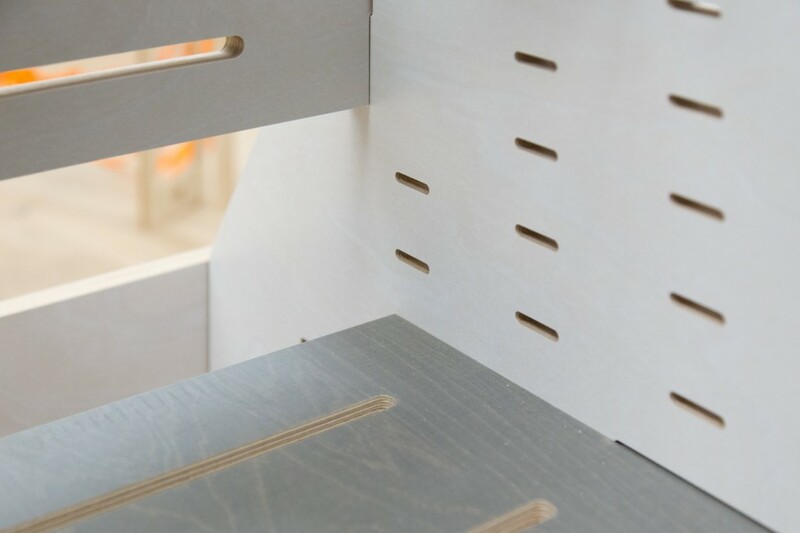 In order to avoid any metal parts, screws and folding (which usually make regular server racks heavy and expensive) we chose plywood, which also makes things easier to directly produce with a CNC mill, based on drawings. 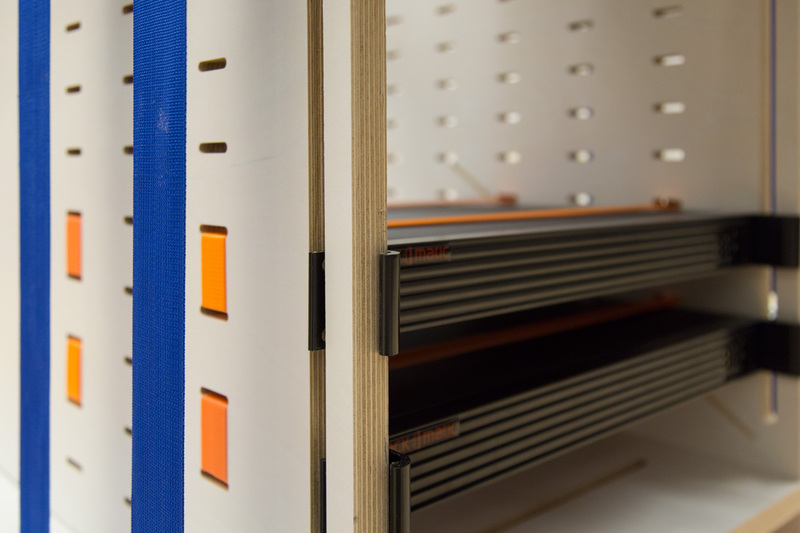 We also chose to go for straps to maintain the server cases in between the two main vertical sides of the rack, as this solution offers extreme modularity and reliable resistance (below). This approach offers a totally modular approach as the racks’s sides are milled every “U” unit in height, enabling users to slide in any height of servers. Due to the shape of the rack, long and heavy servers will sit at the bottom of the rack while shorter ones will stand at its top. Note that the servers cannot be secured (the server is open) as we supposed it is installed at home or inside a small office, mainly accessible by family members and friends. 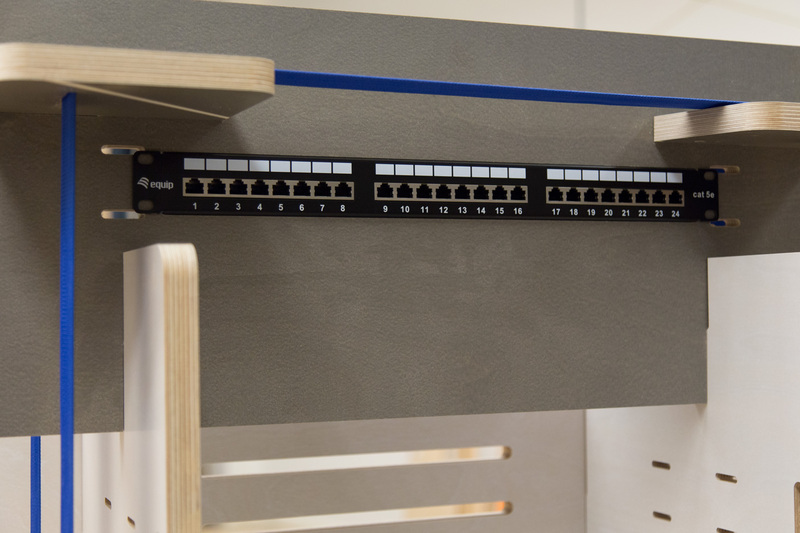 Over the main “body” of the cabinet, a 1U slot has been designed to fit in a router or perhaps a firewall. The back of the rack lets an easy access to cables as well as space for the heat to flow up. 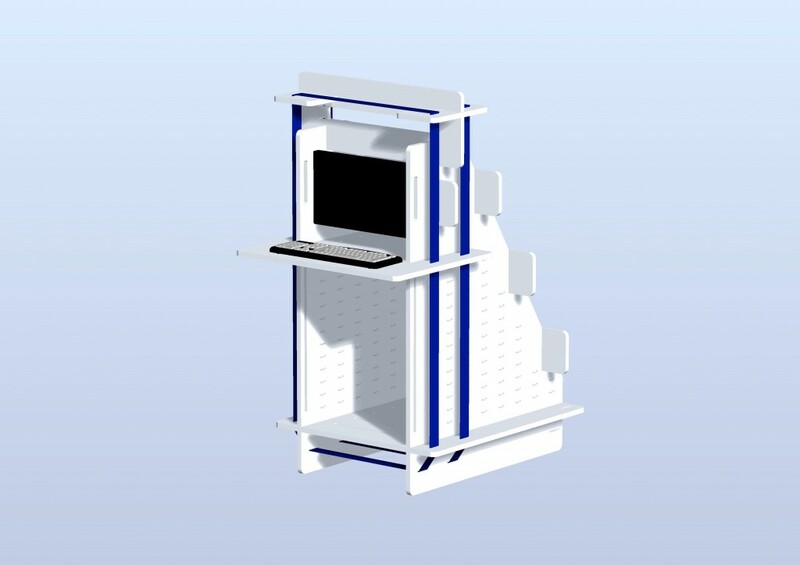 Overall this whole 19″ cabinet could be a simple structure enabling users to hack it to their convenience, perhaps adapting it to the different rooms they choose to set in in. Indeed, setting the server rack as a standardized piece of networking hardware in the living space opens up to several possibilities of “co-existence” between the rack itself and it’s situation in the domestic space. We’ll continue to work on the final models from now on, focusing on solving adaptability to different user contexts (basic technical needs combined with home and office situations. Exploitation of heat as well as air humidification and “cleaning”). We will also optimize the models for a minimum material loss during the milling process.